October 30, 7 PM Update: Based on daily records from the National Climatic Data Center, yesterday's rain from Sandy was also the 5th wettest day of any month in Baltimore climate history dating back to 1871. It was the highest precipitation for any day other than in the months of July through September. 4.06 INCHES OF RAINFALL WAS OBSERVED. 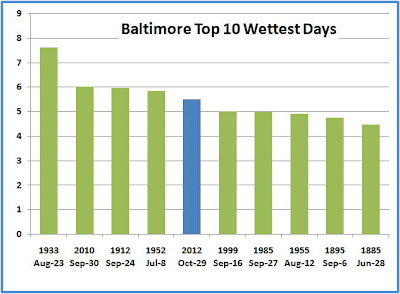 A RECORD RAINFALL OF 5.51 INCHES WAS SET AT BALTIMORE MD YESTERDAY. OCTOBER 1922...WHEN 4.38 INCHES OF RAINFALL WAS OBSERVED. OF 1.72 INCHES SET BACK IN 1953. YESTERDAY. THIS BREAKS THE OLD RECORD OF 2.33 SET IN 1908. A RECORD RAINFALL OF 3.79 INCHES WAS SET AT WILMINGTON DE YESTERDAY. THIS BREAKS THE OLD RECORD OF 2.56 SET IN 1953. A RECORD RAINFALL OF 1.64 INCH(ES) WAS SET AT AVOCA PA TODAY. THIS BREAKS THE OLD RECORD OF 1.39 SET IN 1953. YESTERDAY. THIS BREAKS THE OLD RECORD OF 1.19 SET IN 1973. A RECORD RAINFALL OF 2.93 INCHES WAS SET AT HARRISBURG YESTERDAY. THIS BREAKS THE OLD RECORD OF 1.87 SET IN 1935. A CONTINUOUS WEATHER RECORD HAS BEEN KEPT AT HARRISBURG SINCE 1888. A RECORD RAINFALL OF 1.44 INCHES WAS SET AT ROCHESTER NY YESTERDAY. THIS TIES THE OLD RECORD OF 0.71 SET IN 1935. A RECORD RAINFALL OF 1.42 INCHES WAS SET AT BUFFALO NY YESTERDAY. THIS TIES THE OLD RECORD OF 1.21 SET IN 1917. The unofficial total rainfall today of 3.85" at Washington not only breaks the record for October 29 (2.69" in 1885) by over 1", but it is also the highest precipitation so late in the season. It's the second highest daily amount for any day in October, and it's the only time over 3" has been observed later in the year than October 25, except for the 3.10" on December 7 last year. It would seem that the ECMWF model rules.